Did you know that there are actually five of you? ….Or rather, five distinct layers that constitute you. Would you like to know what those five parts are and how you can support them through yoga? Early yogic scriptures, espouse that we are much more than a mold of skin and bones that then gives rise to thought. Texts, such as the Taittiriya Upanishad, ascribe that we are composed of five distinct bodies or layers called koshas; each one increasingly more subtle than the preceding. Many asana, pranayama and meditation methods are built around the kosha model and are designed to strengthen and harmonize each layer. The physical body or “anumaya kosha” in Sanskrit, is the first and most obvious layer. Anumaya kosha literally means the “food sheath”. It is constituted by the food that we consume. Eventually, our physical body will become food for other creature -and thus the wheel of physical nature turns. Eventually, our physical body will become food for other creature -and thus the wheel of physical nature turns. Maintaining the health of the physical body, whether through diet, ayurvedic principles, asana or other forms of exercise will vitalize the physical body, prevent disease and prepare us for the journey within. Pranamaya kosha, the second layer, is constituted by pranic-energy. This energy is non-material though it influences the workings of the physical body. Chinese medicine draws upon pranic principles through the use of acupuncture, which stimulate pranic-meridians to affect changes in physical health. The sun is the ultimate source of pranic energy for life on earth -its invisible rays bathe the planet in life giving warmth. -its invisible rays bathe the earth in life giving warmth. Prana is also present in the air that we breath and can be optimized through yogic breathing methods called pranayama. Pranayama practices such as the yogic breath, alternate nostril breathing and kapalabhati are designed to increase the health and vitality of the second sheath. One of the simplest ways to regulate the pranamaya kosha is by extending the inhalation and exhalation and making them as subtle and smooth as possible. Aim to create a sustainable rhythm of breath. You can even integrate this practice into the postures, make each pose, or transition between poses, as a kind of breath meditation, become a connoisseur of respiration and sensation. Pranamaya kosha can attune our physical body and influence the third body, manamaya kosha, the mental/sensorial sheath. Manamaya kosha is the instinctual, reflexive aspect of our mind that is designed to keep us safe. It tells us when we are thirsty and allows us to absentmindedly drive from point A to point B without any recollection of the journey. It also processes input from our five senses. Western culture is entrenched in sensorial stimulation. Examples of this include having one dozen tv screens at a pub/restaurant, violent video games, or simple trying to manage so many life responsibilities that leave one unable to sleep at night. Excessive exposure to these forces generate craving for further stimulation and ultimately leaves one’s mental/sensorial body depleted. and ultimately leaves one’s mental/sensorial body depleted. Nourishing manamaya kosha requires being selective of the kinds of impressions we feed our mind. Fortunately, there are many yogic techniques for replenishing the mental body such as the meditation kriyas, repetition of mantra (called japa), and pratayaha (sense withdrawal practices). As a simple recommendation, abstain from the use of electronics for at least an hour and a half before bed to ensure deeper rest. Spend time absorbing the sights, sounds and feel of the natural world. We can also replenish our mind through meaningful work and fulfilling relationships. Start a regular meditation practice. Tantric-yoga informally designates these first three bodies as one-singular-body, because they are most obviously interrelated. How we move and position our physical body (through asana) influences the quality of our breath. How we breath directly informs the quality of our thoughts. And our level of awareness will inturn support us in becoming more sensitive to the needs of the body. Most modern yoga practitioners operate at the level of these first three koshas, gradually purifying their awareness so that they can develop the inner faculty to perceive the final two sheaths. The remaining two bodies, vijanamaya kosha, the body of higher knowledge and undeterred will, and anandamaya kosha, the body of bliss, lye beyond the limitations of our rational cognitive mind. The methodical practice of yoga gradually reveals the light and power of these deeper dimensions of our being and lead to spiritual realization. Whether we consciously recognize it or not, each of the five koshas are perpetually in motion, The process of yoga helps us to become sensitive to their presence and bring optimal health to each body. If you have a desire to learn more about each of these koshas (including the final two) I invite you to attend our upcoming workshop on Saturday, June 28th from 9-3:30 where we will discuss each kosha further and do enjoining practices for each. Handouts provided. Anatomy is the study of the structure and function of the human body, broken down into its parts. Anatomy is the study of the components that create a unified whole. If you wanted to become a great artist, you would want to know how to blend colors. You would need to know the component parts of yellow and blue, if you wanted to paint something green. If you want to move your body in a complex movement, you would want to know the structure and function of the parts of the body involved in the movement. For instance, if you were trying to learn that cool thing that good cooks do where they flip the food into the air from a sauté pan and catch it again, someone may tell you “it’s just a flick of the wrist.” Once you start focusing on the little wrist flick you need to create this movement, you find yourself flipping flapjacks with ease. A little anatomical thought goes a long way. As a kid, when you first start sneaking around or trying not to wake someone up, you are advised to “tip-toe” your way through the halls. At first this is awkward, but the body adapts quickly to the new movement. Learning to ride a bike you are told to “just keep pedaling,” and you’ve just learned a little bit about physics! A moving bike is easier to balance. In P.E. class, if you’ve ever done pull-ups and chin-ups, you may remember that pull-ups (palms facing you) are WAY easier than chin-ups (palms away). This is a straightforward anatomical fact, that you get to really use your biceps brachii muscle in a pull-up. It’s the same reason why all doors open by twisting to the right, or why it’s easier to tighten a screw or a lid than it is to open it (next time you have a lid on a jar that’s REALLY stuck, try opening it left handed! And try not to spill anything….). Anatomy is relevant to all aspects of life. You have a body. Any activity you want to accomplish is going to be carried out by your body (except of course in circumstances of disability, in which case your brain is still calling the shots, so neuro-anatomy suddenly becomes really important!). Anatomy and fitness transformed my life. There was about a decade of my life when my relationship with my body was one of constant abuse, resentment, and pain. This was while I suffered through drug and alcohol abuse. The only association I had with my body was negative. The only exception to that was using drugs to numb the pain of having a body. This was hell. Drunk, hungover, shaking and sweating, fearfully I went to a yoga class. The teacher instructed me to do things like “push through the ball of my foot,” “take a deep breath,” or “sit up proud.” I had an experience of feeling like I accomplished something remarkable in that simple class. I made the monumental achievement of doing something positive with my body, and the effect was HUGE. I definitely cried through my sweat a few times, and in that sweet savasana at the end of class. For the first time in AGES, I experienced a positive association with my body. I was hooked. I went to at least 12 classes in 7 days during my “FREE intro week”. I soon became absolutely fascinated with the amazing ability of yoga teachers to suggest doing some tiny and specific thing with my body, and how it yielded amazingly accurate results. I almost thought they were psychics for a second, the way they seemed to know my body better than I did! For me, learning more and more about my body, my own chemistry, and about the structure and function of various parts of my body gave me new tools with which to explore the world. It taught me how to move fluidly, and pain free. It continues to teach me new ways to manage stress, and pain. It continues to baffle and inspire me, and make me wonder. It makes me want to share this with others. Yoga is a process of self-inquiry. We seek to understand our mind better, so we can find a state of inner peace or happiness. When the body is in pain, or it is anxious or depressed, it is nearly impossible to find inner peace. First we must take care of our body. The amazing thing is – sometimes in moments of deeply concentrated movement and effort, the inner stillness and profound sense of peace and wellbeing just arises from nowhere, like it was buried deep in the knots and tangled fibers of your soft tissues, and just by moving and stretching and breathing and laughing and flowing, this inner peace suddenly springs forth from its imprisonment and overwhelms you with its transformational power. This is why I study movement and anatomy. It’s a gateway to a subtler understanding of our deep inner nature. https://axisyoga.net/wp-content/uploads/2018/08/axis-logo-new.png 0 0 derik https://axisyoga.net/wp-content/uploads/2018/08/axis-logo-new.png derik2018-03-23 02:23:552018-03-22 21:40:22Why Study Yoga Anatomy? Cleansing has become almost a household word these days. 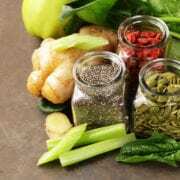 There are many reported and researched health benefits that come from cleansing such as improved digestion, reduced inflammation, dislodging environmental toxins and losing weight. However, I believe there are even more benefits to be gained from doing a cleanse. Cleansing gives us access to expanded mental clarity and a renewed sense of inner freedom. We all have the tendency to eat more from our emotions and habits than our bellies. When we set aside our ingrained eating patterns, we become more conscious of our unconscious habits. Expanding awareness is a cornerstone of yoga practice, and there are many other yogic principles that we can exercise when doing a cleanse. The Sanskrit word “tapas ” means “to burn” and refers to austerities or discipline. By restraining our lower desires and urges, we build a kind of creative friction that gives insight, inspiration, builds character and supports spiritual growth. Tapas has less to do with deprivation and more to do with creating boundaries that bring forth inner radiance. Another major theme in yoga is “soucha” or “purity”. Given adequate support your body naturally wants to return to an optional state of cleanliness and efficiency. By releasing the accumulated toxic load of ongoing unconscious eating habits we open the gateway for a deeper state of health and long forgotten purity. It’s like letting go of a “heavy load” we had no idea we were carrying for so long. Doing a cleanse is less of an exercise in deprivation as it is an opportunity to revitalize your mind, strengthen your will and do a deep internal “cleanse”. We can access the bodies deep healing capacities by simple removing the obstacles to cure, by eliminating less than wholesome foods and introducing foods that are more conducive to vitality. Get your day started with a refreshing and vitalizing glass of hot lemon water. It is amazing how this simple beverage will pick you up. It helps alkalize your system, and cleanse your liver. What’s more, hot lemon water will stimulate your bowels and get things moving. Many people do not drink enough water in general and making a ritual of drinking this beverage early in the morning is a great reminder of how amazing water is for your health! In my naturopathic doctoring practice, many people tell me that they have an aversion to eating vegetables. They also come to see me with significant health issues, many of which can be greatly offset with dietary changes -such as eating more vegetables. While your tongue may disagree, your body loves vegetables and rings with satisfaction once fed what it needs. Eating a sufficient amount of vegetables will also off-set cravings for foods that are far less nutritious or even detrimental to one’s health. Often times sugar-cravings are rooted in not eating a sufficient amount of protein. If you find yourself feeling hostage to sugary foods there is a good chance you are in need of more protein. Eating enough protein will help you balance your blood sugar and give you a more even-quality of energy throughout the day. Getting enough protein also helps you eat less refined carbohydrates. Many cultures and spiritual traditions throughout the world recognize the value of fasting as a way to cleanse the body, revitalize the spirit and develop humility and gratitude. Fasting is also a great way to give your digestive system a much needed rest. Your body will naturally go to work cleaning house with the energy it would otherwise expend digesting food. Generating the necessary discipline to fast also rubs off in other areas of your life. It gives you the inner strength to address other issues that you may have been avoiding, freeing up energy that could be spent more productively. Note: You can still have juices, broths, teas and water while performing a weekly fast. Try on these simple tips and see what they do for your health and your yoga practice. If you are ready to take it to the next level, consider getting some outside support and supplementation by participating in a 10-day cleanse group I will be facilitating. Cleansers of all levels are welcome! Cost: In the Spirit of Axis’ Mission to make it’s offerings inclusive and accessible, the cost is $108-$198 and includes both meetings, a booklet, recipes, and supplements. Most of us know yoga through the postures. Perhaps we have even heard the Sanskrit word “prana” mentioned in class, though this is the exception to the rule. Traditionally speaking, the pranic-force is fundamental to yoga practice (including the postures) and is as essential as sunlight is to a plant. The word itself is commonly translated as “vital-force” or even “the breath”. Prana is a much larger idea than that. A more literal translation of the word means “the first breath”. It is the first, primal, all pervading, energizing force of the creation. The sun is imbued with prana, the plants and animals possess prana, the air is rich in prana. The ancient yogis readily perceived this pranic energy and found ways to maximize its influence on our physical health, mental clarity, and spiritual development. Many of the techniques that are commonly used today, such as asana, pranayama, and even meditation are built around pranic principles (whether we actively recognize it or not). The very namesake of ha-tha yoga, the system of yoga that is the genesis of many modern poses, references the mind and its relationship to prana. “Ha” literally means moon, and “tha” means sun. The moon, due to its waxing and waning nature, is the emblem of the mind. The sun, due to its singular life-given radiance, is in reference to prana. Hatha yoga, is the union of the moon and the sun, the mind and prana. Hatha yoga emphasises the skillful use of prana to expand consciousness within the mind and ultimately, beyond the mind. Through specific breathing techniques or pranayama, we can affect specific states of mind; states of mind that are more conducive to deeper states of peace, joy, and fulfillment. In the coming three-part series we will explore the intimate relationship between prana, breathing, and the mind and provide useful tips on how to work consciously with the breath at the Beginning, Middle and End of your asana practice. Our Spring training begins on Feb. 13. CLICK HERE to learn more and to enroll. Welcome to a New Year yogis! As we set new intentions, goals and visions for the next 12 months let’s all agree that we can ditch the word “resolution”. Many people equate “resolution” with trying to change some behavior for a while, only to be met with inevitable egoic disappointment. The whole notion behind “resolutions” is that there is something wrong with us, that we are defective, and need to make some kind of big, overnight change to become complete. I’d like you to consider, or at least hold the possibility, that you are enough. Yogic teachings tell us that there is an aspect of our being that is already complete, already whole and inherently perfect. Rather than getting down about all of our seeming shortcomings, begin by acknowledging your inborn radiance and divinity. Your Soul. The tradition goes on to tell us that the soul has both a higher and lower nature, the paratman and jivatman, respectively. The journey of life is the journey of aligning our higher and lower natures. There are many yogic methods for uniting our higher our lower aspects, one of which is the notion of sankalpa. A sankalpa is a vow or commitment we make in support of our highest truth. A sankalpa can also be an expression of either the paratman or the jivatman so long as it resonates with the deep quality of truth. One is not necessarily better than the other, though the general path of yoga is to draw closer and closer towards the paratman. As we navigate our way through life we will inevitably encounter material and intra-personal obstacles that will force us to act on behalf of our lower or higher natures. How will you approach these obstacles? Who and what will you reference? A sankalpa is like a compass, it tells us which direction to move in as we face the terrain of our lives. As we face the terrain of the coming year, I invite you to reflect upon who you are becoming. Is there some dormant, higher aspect of yourself that you are willing to cultivate, even in seemingly small ways? If your resolve is more material, start there, the voice of the jivatman has a legitimate place on the path of yoga, just be mindful of where that voice is coming from. Be inspired by new possibilities rather than egoic, fear-based feelings of inadequacy. Giving in a way that promotes mindfulness take some intention. It’s the Holiday season. So it’s just natural to be in a state of gratitude and celebration. Our focus is on family, friends….and gift giving. We also find ourselves in the throws of marketing, advertising and frivolous consumption. How can we remain mindful in this crazy time of year and even in the way we give gifts? While it takes some intention and maybe a bit of planning, it’s possible to give gifts in a mindful manner. This great article by LC Yoga talks about what mindful gifts are and even gives us step-by-step instruction on how to make gift giving a bit more meaningful. Come find out more about Axis Yoga’s ongoing yoga teacher trainings. 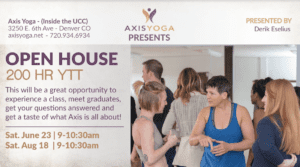 This will be a great opportunity to experience a class, meet graduates, get your questions answered and get a taste of what Axis is all about! Click here for more information. Historically, yogis believed that there was an inseparable relationship between yoga and sound/sound vibrations. Since the earliest ages the sages chanted devotional hymns, meditated on the sound of chakras, and recited mantras -traditions that live on into this day. Perhaps you have experienced some of these practices yourself within the modern day gym or studio. Or, if nothing else, are familiar with the practice of chanting AUM (also spelled OM). Many core concepts are imbedded within the sound of OM that are integral to traditional yoga. First, OM is commonly chanted in one in one of two ways, as indicated by the two ways in which it is spelled. In the case of the most frequent spelling (OM) the sound is rendered very much like it is spelled O-M. (According to Sanskrit rules of grammar the A and U sounds collapse into one another to make the O sound). From the tantric-yoga perspective, the sounds are more distinct: A as in “car”, U as in “soup”, and M sounds more like the vibrational-drown of a bee. Either pronunciation will suffice. Being the genesis of all manifestation, OM is regarded as the sound that contains all sounds. There are a number of schema that describes how this process works the simplest of which is the trajectory of how the sound directs itself through the mouth. The A sound begins in the back of the throat, it then fills the cavern of the mouth with the U sound and finally closes at the lips with the M sound; thereby covering the entire spectrum of potential sound as expressed through the mouth. Integrate this understanding the next time you express the sound of OM. Bring your conscious attention to how the entire range of the sound travels from the back of the throat to the lips, articulating each sound along the way. The same methodology can be applied to extending the sound from the base of the spine and up and out of the crown of the head. According to the yoga tradition, the spine is the axis of awareness. 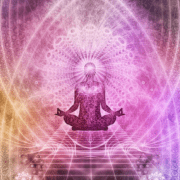 There are many forms of meditation (such as meditating upon chakras) that utilize this principle to cultivate expanded states of consciousness. In this way, one can direct the sound of A from the pelvic floor to the navel, the U sound from the navel to the throat and finally the M sound through skull and up and out through the top of the head. Try it! You can incorporate either of these OM expanding techniques to the practice of AUM-Kar or the successive, unbridled repetition of OM. This is best practiced with a group of your fellow yogis. The rules are rather simple, chant OM as many times as you can! Each individual chants OM at their own pace, creating a symphony of voices as the sound of each chanter overlaps with one another. At some point, the sound will naturally subside, leaving a palpable stillness and calm. If you are a teacher, consider doing this practice in your next class, or practice with home with friends! It is essential to pause and immerse yourself in the resounding silent echo of the sound to fully appreciate every aspect of OM. The silence after chanting this sacred syllable is actually consider to be a fourth sound called turya, which simple means “the fourth”. Turya is the all subsuming, transcendent aspect of PM – beyond time and space. The sound returns to is origin, which it never left. Immerse yourself in the peace and stillness! We are pleased to announce a very special guest performance by none other than Denver’s beloved hero of sound healing, Mr. Gary Fishman. Gary’s “Gong Baths” are extraordinarily soothing and renewing to the entire nervous system. See more at Gary’s personal website, songs of the milky way. Bring something comfortable to rest on the ground with. Any and all are welcome to attend this interstellar voyage of cellular renewal. Bring something to lye down on such as a blanket, a yoga mat or some combination of the above. Click here for more information. https://axisyoga.net/wp-content/uploads/2018/08/axis-logo-new.png 0 0 derik https://axisyoga.net/wp-content/uploads/2018/08/axis-logo-new.png derik2017-11-06 04:41:012017-11-08 11:23:405 Simple Ways to Invigorate Your "OM"